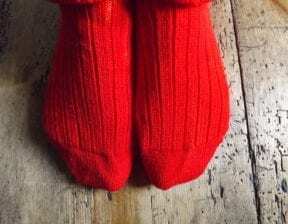 Christmas Stockings – well they have to be red don’t they! And when it comes to natural dyeing nothing does red like cochineal. Cochineal is expensive, it always has been. Highly prized for centuries as producing the best reds for textile dyeing. When it arrived in Europe following the Spanish conquest of Mexico it was something of a mystery as to whether these tiny greyish flecks were insects or seeds. When they realised how lucrative Cochineal could be the Spanish held a monopoly on the trade, closely guarding its secrets. There’s a great book A Perfect Red by Amy Butler Greenfield which tells the whole story. Dried cochineal beetles (bought in little one ounce jars) produces dyes with a pinkish hue. To make a true scarlet red (as Christmas Stocking should be) then either a tin mordant or the addition of oxalic acid is required. But having found and then bought 50g of cochineal extract (from Wingham Wool Work) it seems that this has been more refined and processed (some acid added possibly). 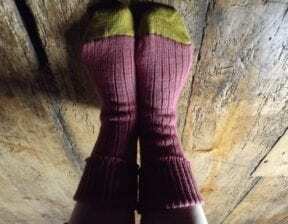 Following some issues with mordanting, resulting in scratchy yarn that jammed in the Sock Knitting Machine, the decision was made to get around the problem by making up undyed stockings and then garment dyeing them ‘in the piece’. ….And the cochineal turned this……. The stuff’s not cheap. Over 14 quid for 50g. 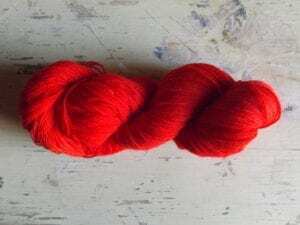 But just 2 grams will dye 100g of wool a brilliant scarlet. And is has to be said that using an extract in powder from is a lot less fuss than the usual natural dye making process and worth it for some Christmas stocking specials. 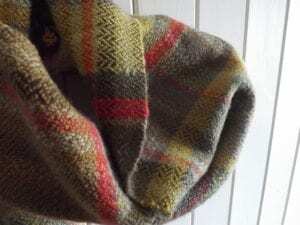 One note: some of that ‘scratchy’ yarn got used for a bit of scarf weaving. Fabulous scarlet flashes in amongst all the more earthy tones. But when the scarves come off the loom they need ‘wet finishing’. Which around here involves putting them through a 60 degree shirt wash to turn the loose weave into a proper fabric with stability and drape. Somehow during the wash that brilliant scarlet turned decidedly pinky/coral. 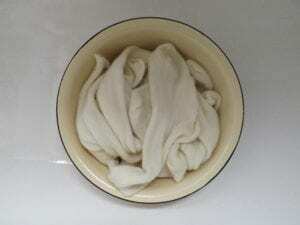 This is probably caused by the alkali in the detergent and washing soda used, plus the high temperature. But the colour is still lovely. Meanwhile, they’ll be some Scarlet Stockings hanging over the fireplace this Christmas.